Often times people forget that I am an athletic therapist as well as a Chiropractor. I treat all forms of muscle and joint injuries. Chiropractors are trained to adjust all joints in our body not just the spine. Athletic therapists are excellent at understanding movement, exercise prescription and treatment for acute/chronic injuries. When I decided to become a Chiropractor it was so I could expand my treatment skills so I could serve my patients more completely. Check out this testimonial from one of my patients. 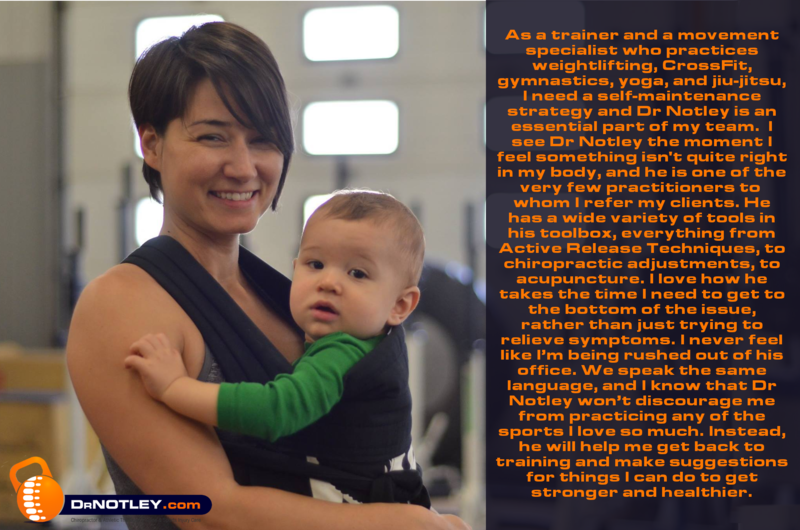 As a trainer and a movement specialist who practices weightlifting, CrossFit, gymnastics, yoga, and jiu-jitsu, I need a self-maintenance strategy and Dr Notley is an essential part of my team. I see Dr. Notley the moment I feel something isn’t quite right in my body, and he is one of the very few practitioners to whom I refer my clients. He has a wide variety of tools in his toolbox, everything from Active Release Techniques, to chiropractic adjustments, to acupuncture. I love how he takes the time I need to get to the bottom of the issue, rather than just trying to relieve symptoms. I never feel like I’m being rushed out of his office. We speak the same language, and I know that Dr. Notley won’t discourage me from practicing any of the sports I love so much. Instead, he will help me get back to training and make suggestions for things I can do to get stronger and healthier. This entry was posted in Testimonial and tagged testimonial by Christopher Notley. Bookmark the permalink.